In the battle for prime footwear lordship in, arguably, the sport where footwear choice is most important, adidas hopes to strike another blow by adding to their impressive laceless collection. Not content to have 2/3 of their elite releases sans laces, adidas has now decided to take the X silo and bring the 18+ version into the laceless fold. Utilizing the world’s biggest stage at the Champions League Final and World Cup, it wasn’t going to be a release that slipped under the radar. 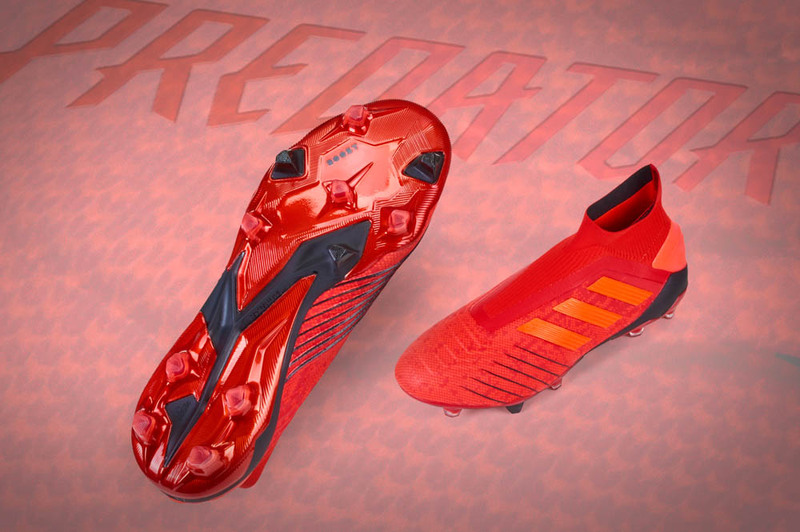 A new look, a new upper, and the reminder that the adidas X series was always meant to be the boot that causes chaos. 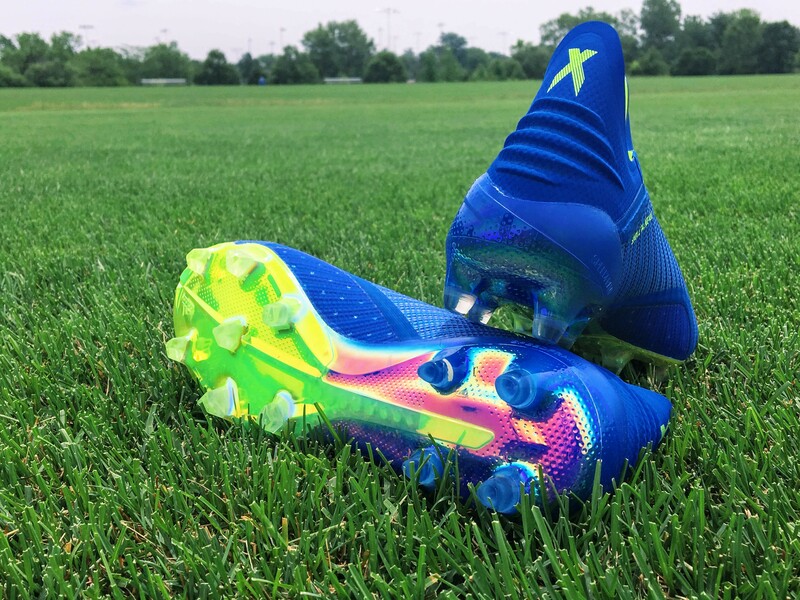 Ready to join the impressive Predator and Nemeziz options that have succeeded on a grand scale without laces, the X has taken a different route in using mostly synthetics and an extreme lack of knitted materials to lock you in and help you take your game to the next level. Can the X 18+ finally find the ultimate answer to laceless lockdown while still giving the feel the the X+ series has been providing since the X 17+? Stay locked in for the most comprehensive review on the net. You looking for just glorified tech specs? Go somewhere else. You want a review on how these boots perform? You’ve found the right place. The X series has always been the outspoken member of the adidas family since the boot took over for the F50 several years ago. Oddly enough, this version might also be the most visually close to “Is that a new F50?” that we’ve ever gotten with the way it has gone wading back into the comfortable adidas waters of blue/yellow that we first saw on the original adiPower. For the 18+, the Skeletalweave that runs across the upper provides the biggest visual aspect of the boot, and it is interesting to see the strands shift from tightly placed towards the heel and start to open up (looking almost like visual strands of DNA) towards the forefoot. The bright three stripes in the forefoot leaves no doubt as to who created this boot. On the 18+, they’ve been given a slightly iridescent finish to really pop off the boot, and the logo is the only non-blue part of the upper (outside of a small “X” callout at the top of the heel). The most mundane part visually might be the most important part that allows this boot to be laceless, and that bit is the Techfit tongue. Even the adidas logo has been made to blend by using a similar color blue, and only in hand do you realize that there are actual ridges on this area. We are anxious to see where adidas goes in terms of future colorways, especially if they go with two vastly different colors in the Skeletalweave fibers, that will be fun! One last thought is how we love the soleplate memo that, apparently, every brand has decided to follow in terms of looks. While the only people seeing the bottom of your boots are you and the players you leave in your wake, the X 18+ has a truly eye-catching soleplate. Be forewarned that hard use and heavy tackles might see the finish chip or fade, but we’re on board for brands taking advantage of the heavy plastic style materials beneath our feet and taking some strong color risks. If you can’t take risks in the least seen part of a boot, where can you take risks? 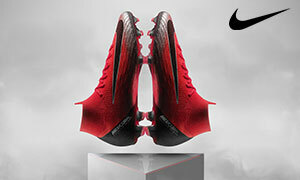 While the X 18+ makes us feel like we should be doing experiments in a wind tunnel, it’s getting these boots on the field and in front of a ball that determines whether these can be a legend in their own right or if we’ll be sitting here at the end thinking about what could have been. 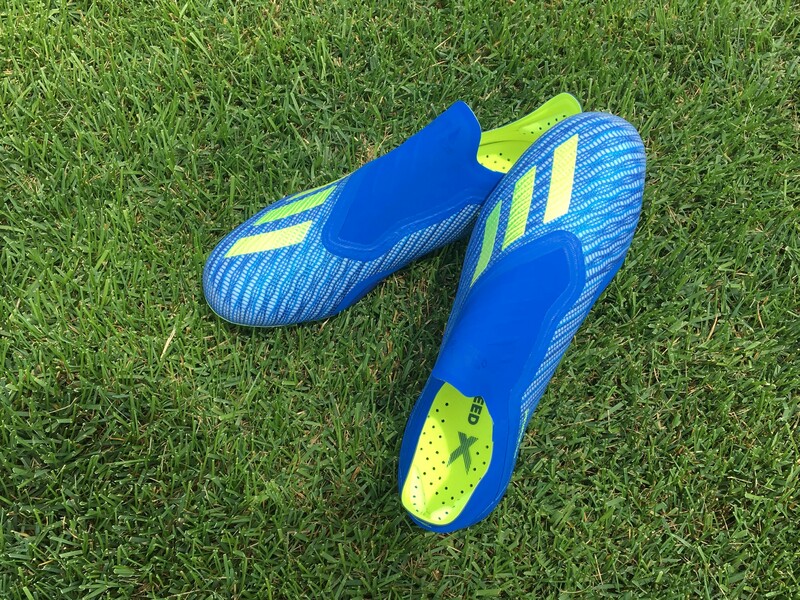 For a boot that looks like an homage to the F50, with no laces, and with the build of the PureSpeed, we were ready to head straight towards the closest defender and see what these boots had in store. We loved the original PureSpeed X 16+, but felt like the X 17+ had been too small of a change for a proper boot update. The X 18+ has changed everything, but has it done it all for the greater good? Your first few minutes into these boots are going to be spent realizing how closely the boot hugs your foot despite laces, and that there’s a bit of stiffness on the ball. This fades after break-in, and you realize that this boot’s glory lies in the soft liner that runs under all of the Skeletalweave portions of the boot. Despite what we thought from pictures and with the boot in our hand, the Skeletalweave and thin synthetic layer on top of everything is merely to give the boot its shape and keep your foot locked in. The weave isn’t your typical knit (it’s just a few strands and nothing like what we’ve seen from FlyKnit or PrimeKnit releases), and doesn’t do anything to really give a different feel on the ball. There also isn’t quite enough to say that there is added friction on the ball. That soft liner means that every moment spent on the ball gives a nice light padding that the X series has been showcasing since the X 16+. Sure, it’s laceless and fairly light (right around 7 ounces), but this feel for the ball means that you aren’t going to walk away screaming “barefoot feel,” instead you’ll be waxing about how soft this boot makes your time on the ball. Whether dribbling at speed, bringing a ball out of the air, receiving a pass on your instep, or lifting a cross-field pass, the boot feels like it gives a near perfect level of cushion. Imagine the type of padding from a really high quality, thin sock. It’s almost like that’s what adidas hoped to achieve here, and then added the weave to allow that “sock” to stand the rigors of soccer. Despite the padding, dribbling at speed never has any issues. The ball never feels stuck under your feet and the padding isn’t so thick that you ever feel like the ball just disappears. If you’re the type of player that loves the type of dribbling devoted to slight pushes forward with the outside portion of your forefoot, this boot’s build and materials are absolutely custom made for that. However, if you’re hunting for the closest possible sensation to the ball, there are more suited options available on the market (and they tend to have laces). Once again, unlike the rest of the adidas laceless line-up, this boot is not knitted, and you definitely realize that throughout play. The Techfit area where the tongue would sit is incredibly thin, with none of the padding we see on the rest of the boot. This means that shots absolutely ping off of this area of the boot and it’s the type of shooting sensation that boots built for “speed” should strive to achieve. However, an opponent’s stud placed in this area would see you have zero protection from your foot so brace for impact. Such is the duality of the speed boot, but attackers in tight spaces will love how much they can get behind the ball by striking with this area. If trying to curl the ball around a wall is more your speed instead of smashing through the back of the ball with your “laces,” the padding also makes these types of shots feel great as they leave your foot. 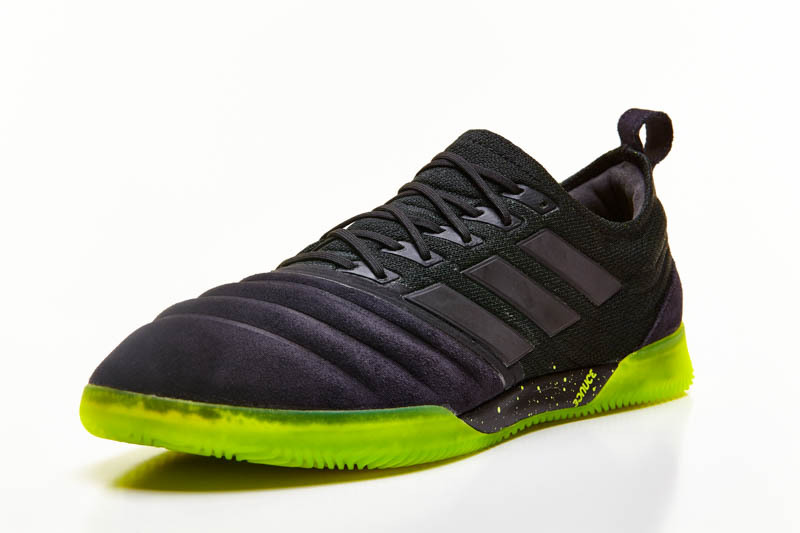 There is an odd change of material near the bottom of instep, but we imagine that it’s purely for durability purposes (this area has always been a durability worry for adidas speed boots since the F50). It isn’t too different in texture and might have the slightest bit more padding, but claiming it alters the feel when utilizing this area would be naive. 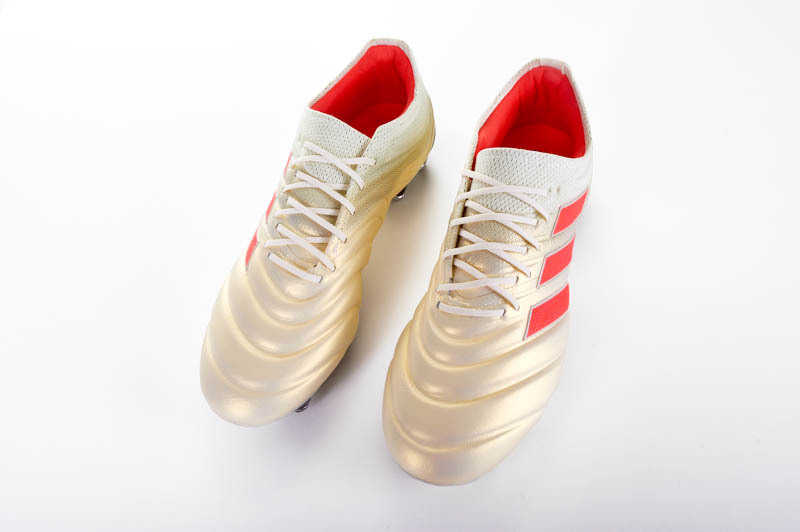 The soleplate will be a welcome sight for fans of the Sprintframe, and this set-up adidas has gone for underfoot does exactly what you’d want from a quality boot: it allows you to not worry about any slippage issues. We did have some slight moments of embarrassment in fields where there was a bit more mud than we would have liked (those big arrow forefoot studs hold mud like it’s their life’s purpose), but most firm ground fields will see you zipping around with ease. Take note, adidas has fully stepped away from offering FG/AG on the same boot with these, so we wouldn’t advise you to snag the FG soleplate if you’re going to be playing on primarily artificial surfaces (I also think that AG surfaces would play havoc with this upper’s durability, but I didn’t actually test that theory). If you stay on FG surfaces, expect these boot to certainly last well over a season as they are certainly built to last. I’ve been able to wear both boots for a quite a while now, and the biggest difference is (much like the other + vs .1 versions) how the boot is able to be built differently because of the laces. The 18.1 isn’t quite as rigid as the 18+ (nor is it as visually appealing), the 18.1 gives a bit better lockdown, the edge of the toebox sits ever so slightly lower, and it’s a bit more forgiving to your foot. However, we wish that the quality of padding in the 18+ carried over to the 18.1 as the PureSpeed just seems to have that extra bit of plushness that we can’t get over. 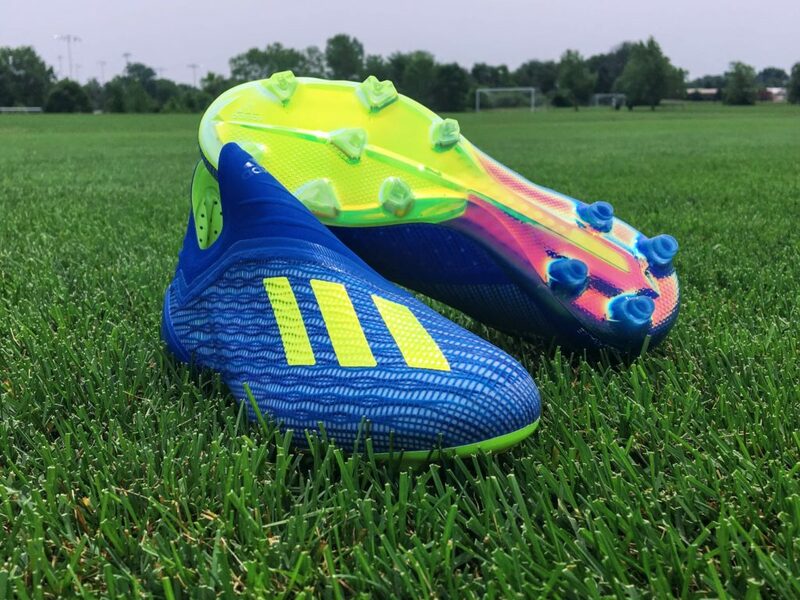 It’s always impressive when adidas is able to create such a thin feeling boot while still maintaining a level of comfort that we’d expect from an elite soccer cleat. With the X18+, the feel and comfort is best described as, “unique.” This isn’t going to be a boot that’s ready for 90 minutes as soon as it arrives at your doorstep but the upper’s rigidity can’t be seen as too much of a negative. Why? Well, in order to provide a decent fit and some type of responsiveness, the upper and boot has to be a bit more rigid than most boots out of the box and, despite the upper softening up each time you use them, that feel has to remain in order for the boot to function at a high level. If you try and rush these boots without utilizing a slower break-in, be prepared for some toe blisters and heel blisters. Now, the heel has some serious padding right above where your heel will sit in this boot, and it does provide a nice cushioned feel above your heel/beginning of your Achilles tendon, but that padding ends at the base of the boot. That’s in order to help aid in keeping your foot locked in instead of being a predominantly comfort oriented addition. Once everything has gotten broken-in, the comfort provided from the padding in the upper is something we’ve come to expect from the adidas X+ line. With the soft, almost suede-like lining, it feels a bit like being wrapped in a really thin pillow. With the shift away from the S-curve heel and the tip of the tongue area, it would be a mistake to use extremely low-cut socks while wearing the X 18+. Make sure you have these two spots covered by a sock, or be prepared for a blister. The soleplate is a mash of different shaped studs. The forefoot has arrow shaped studs to dig in and help you push off with your toes, the midfoot has diamond shaped studs to help keep you planted, and the heel has teardrop style studs to help be able to keep from feeling like your heel is stuck while helping with mobility. In order to help aid a boot without laces, the soleplate has a great level of responsiveness and a great flex in the forefoot right out of the box. For sizing, we’d suggest trying the bad boys on before you take the final plunge. The perfect fit is vital to your enjoyment of the 18+, but, if trying them on isn’t an option, they fit true to size for us. Also be aware that, while it wouldn’t be considered a narrow boot, this is not a boot made for wide feet. Most players should be fine with the 18+, but the caveat of any laceless boot is going to be that the fit out of the box is the fit that you’re going to have throughout the lifetime of the boot. This is one of those boots that climbs up into the elite world of pricing, and it will take a bit of justifying on your part to have the X 18+ showing up on your front steps. The retail cost for the 18+ is $280. It’s not cheap, but this is going to be considered the best of the best from the three stripes. If your wallet has this type of flex, then go for it! In terms of goodies that you get with the X 18+, this boot comes in one of the adidas drawer-type boxes and includes a mesh string bag that will allow you to carry your new toys around while simultaneously showing them off to your jealous friends! Luis Suarez, Mo Salah, and a host of others are rocking the laceless X but the headliner is Brazil’s Gabriel Jesus. It will be interesting to see if professionals gravitate more towards the laceless 18+ or the 18.1, especially as many players seemed to opt for the noticeably inferior X 17.1 over the impressive adidas 17+. Expect to continue to see a bunch of these boots at the World Cup and during the upcoming European seasons. 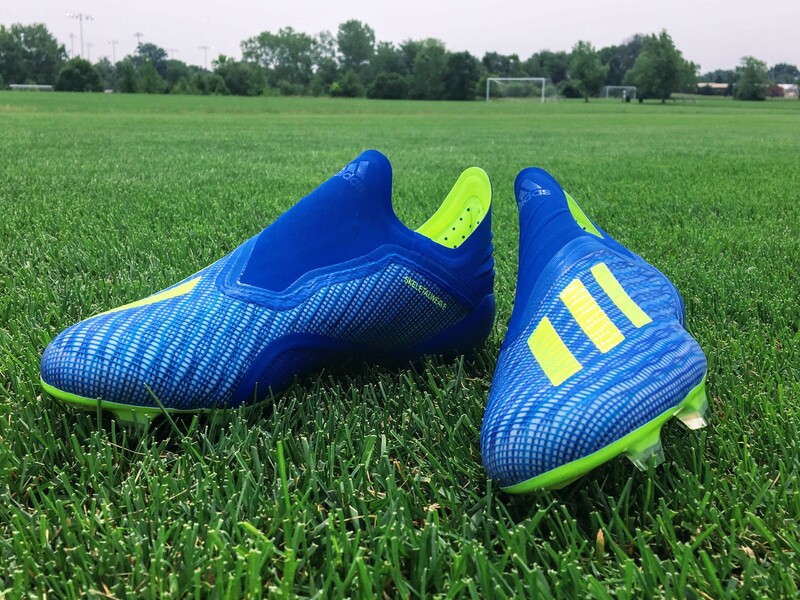 The shift to X 16+ gave us one of our favorite adidas boots over the last several seasons and the X 17+ continued that feel, but the X 18+ finds success in a totally different build. A unique boot, the entire enjoyment of the boot comes down to finding the right sizing. If you snag the perfect fit, the X 18+ is going to be a blast for anybody that is able to get their hands on the boot. This beauty somehow finds a perfect blend between being padded for comfort and a supple touch while still giving you the impression of being thin and always feeling close to the ball. It’s still tough to push a laceless boot up above a laced option, but the X 18+ is a great boot and we can’t wait to see where the boot goes from here.